In early March 1906 Joe Kerber was found dead in his cabin on Rock Creek when two men swam across the Clark's Fork River to get a boat. When two men swam the river to get a boat, Joe's dog ran out to meet them, and then ran back to it's master. When the men got to the cabin the dog was licking the dead man's face. Joe had been dead about four days and was lying on his stomach flat on the floor with his chin resting on a coal oil can.best in that section. A bottle of strychnine was found in the house. Foul play was suspected and some thought Kerber might have been poisoned. He was buried at Noxon in a coffin ordered from Missoula. Little was known about Keber except he had a sister in the old country.1. Earl Engle, Fred W. Raynor, Mrs. Wm Raynor, Arthur W. Raynor, Guy J. Engle, Charles B. Raynor and Isaac Engle were ordered to appear as witnesses for a coroner's jury. About the end of May, some sort of ruckus that is now lost to history occurred in Heron, because the newspaper reported that when the county commissioners met June 4 at their headquarters in Thompson Falls, Samual J. Higgins stalked from the train to their office and slapped down his resignation as Justice of the Peace of Smead Township. Fast on his heels were other citizens of Heron, there to complain about J. Colberg's saloon in Heron. By 1906 the Berrays had returned to their Bull River homestead and Frank and Algie were sent to stay at Heron during the school year, for a few terms. 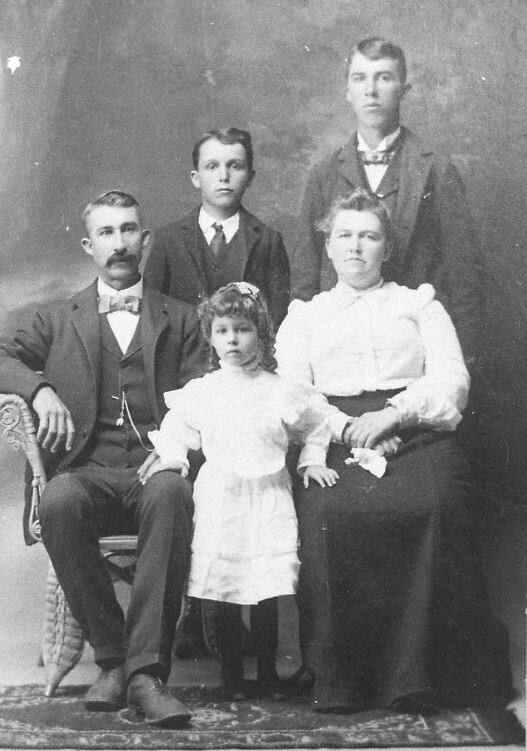 Their parents felt no compunction about letting their young sons walk down the valley to ride the ferry across the Clark's Fork River, and then hop a train to Heron where they would either 'batch' or work for board and room. If the lads batched it meant doing everything necessary to live, fetching water, provisions, cooking, housekeeping, keeping fires burning, and whatever else they required. Getting an education took priority over everything else. Miss LaFey, one of Heron's outstanding teachers, told Mr. and Mrs. Berray that if their sons cleaned up a little shack where her goats had been kept, they could stay there. So they cleaned it up. After they'd lived in the little shack about a month Miss LaFey reclaimed it, moving there herself. Not everyone in the community approved of Lois LaFey allowing her chickens to roost on her bedstead but the highly independent young woman was considered too good a teacher to let go.2. The two boys earned $15 a month for janitor work at the school and did odd jobs for people. Frank said, "Heron had no water supply so Algie and I used to haul water from Elk Creek using a wagon and barrels," Frank said. "People got water from trains, off the eaves, and melted snow and ice. Most of the washing was done with water from the eaves." On weekends the lads walked home to their parents ranch on Bull River. Leda Jenkins, Georgia Knott. Courtesy Georgia Knott MacSpadden collection. Miss McHugh, Miss Riley, Mr. Reese Price and Carolyn Larson, Heron teachers prior to1910. Courtesy Georgia Knott MacSpadden collection. 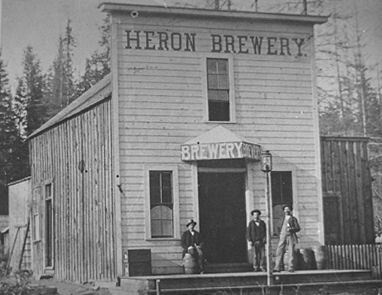 Heron Brewery. Courtesy Elizabeth Larson Weber collection. "Schwint ran a bar at the same time. No license, just a blind pig. He had a big fifty gallon barrel and then he'd cut it down before he sold it." 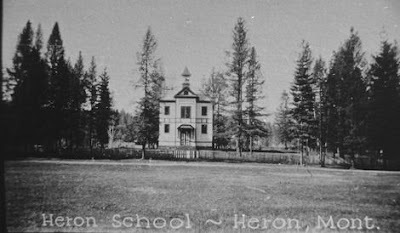 ﻿The ﻿Knutsons lived at Heron for a time, also, and Johnny and Charlie went to school there until their parents returned to the NPRR sectionsman's house at Noxon. While Frank and Algie were batching in Heron, getting more than just formal education in school, their uncle Jim Berray was exploring the Indian sweat baths on the shores of the shallow little lake on the Berray homestead in Bull River. Jim found an old cabin there, which the Berrays and their neighbors presumed had been a fur trapper's cabin. Hunting bear became a part of homesteading. In addition to the income from a prime, luxurious bearskin, bear provided meat. Housewives also canned the meat, and fat rendered from the carcass was often the only lard in a woman's cupboard. Discriminating cooks prefered bear lard over pork lard for pie crusts, frying, cookies and other recipes that required shortening or oil. Women who made their own soap prized bear lard, and used it also in remedies such as those for colds, scabies, and ringworm. In many households bear lard was also considered a necessity as a hair conditioner. Venison (deer meat) was another staple item. Tallow (venison fat) became an excellent boot dressing. Heated in any available container until the tallow liquified, and when brush on shoes and boots it penetrated leather readily, and waterproofed it. The odorous process left a lingering distinctly-wilderness stench in the room. Because tallow coated dishes almost as tenaciously as wax, dishwashing was more difficult. Women who didn't use soap in their dishwater depended on keeping the water extremely hot, because after cleaning the dishes the water went into the bucket of hog-slop. 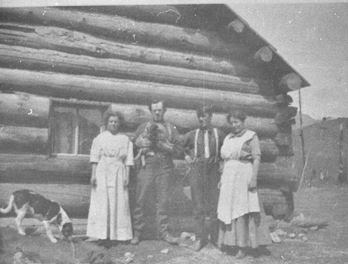 Jesse and Mary Beason and their daughter, Nora, in their first homestead cabin on the northside of the Clark's Fork River, a mile east of Bull River. Circa 1900. Note their 'refrigerator' (box attached beside the door.) Courtesy Clayton Bauer collection. Isolation was part of the price of staying in the beautiful mountain country, and people dealt with it in a variety of ways. While some boozed, others used opium. The later were most effected after Federal Pure Food laws went into effect at the close of 1906. Food and Drug regulations and inspections were necessitated by such widespread adulteration of food articles, medicines and packing products that they constituted a national abuse. Meant to be a protection for food consumers, the law also outlawed opium and laudanum, a serious blow to the Chinese. The opium smoked by the Chinese at Noxon was a thick paste resembling earwax. They used small round clay pots with a tiny hole in the top. Using a long steel needle, like a darning needle, (called a yen chi dow) a dab of opium was inserted into the pot. They cooked the opium over a lamp that provided a small blaze, shoving the opium down into the bowl as it cooked. The Chinese smoked the bowl of opium as it cooked. Using a bamboo stem about fourteen inches long they sucked the smoke in as deeply as they could. Each little dab provided about two or three good drags. Then the cooking would have to begin all over again. The opium didn't make them sleepy, instead they'd smoke and then play poker. It had a stronger effect on them than liquor. At Milan, seven miles from Cabinet, Idaho, one distraught woman pulled a gun on the storeowner to make him sell her all his laudanum. Some folks used it as a medicine while others were addicted to the opium it contained. Mrs. Finnigan of Noxon used it for toothache relief. Roy Tallmadge had no use for opium and little time for card playing. 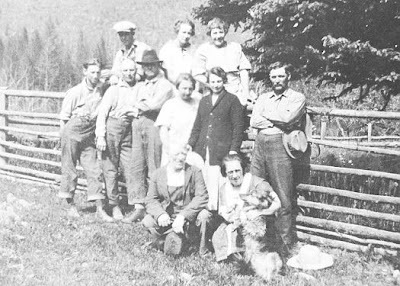 Up on the North Fork of Bull River he was building a honeymoon home for the girl he was engaged to marry, Monti Milner of Milner Lake a few miles north of Bull Lake. But Monti married someone else. When Frank Silcox, the Forest Supervisor, arrived at Roy's homestead he told Roy the government was withdrawing his land as a possible future administrative site. Instead of protesting the unfairness of the government taking his land and the improvements he'd made, Roy just walked off and left the nice home he'd been so happy building. Soon local folks referred to it as the 'Lost Girl' place. Years later the name 'Lost Girl' was given to a creek near the Bull River Ranger Station several miles downstream. Mr. and Mrs. Bauer (kneeling), Granville Bauer, Chess Greer, Harry Wilson, Mrs. Alzire Greer, Mrs. Lilly Cotton, Marion Cotton, George Gardiner, Mrs. Irene Wilson, Mrs. Lockman. Courtesy Clayton Bauer collection. 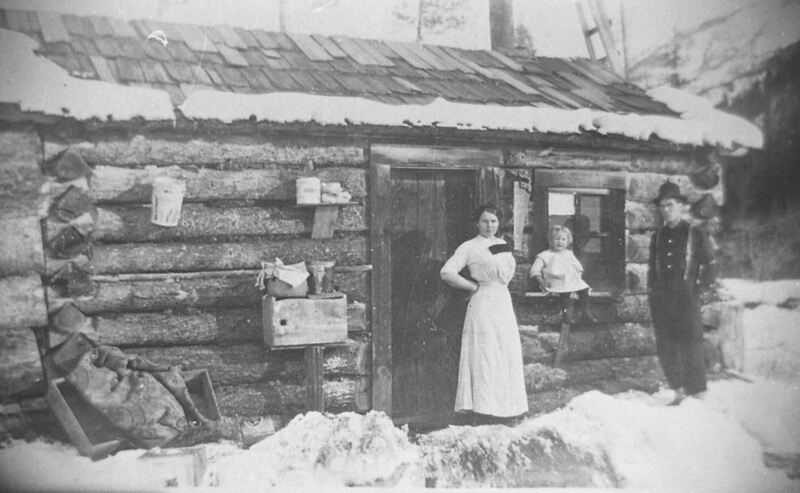 A butcher shop had been opened at Trout Creek to provide fresh meat. Pat Moran and Marion Cotton acquired it from J. L. Hartman, the previous owner. With the idea of having a local outlet for the cattle they were raising on Bull River, the partners expected to also eliminate the impossible task of driving their cattle through the forests to the nearest railhead. The free ranging critters were as wary and easily spooked as any wild animal in the mountains. Irvin Hurst and Granville 'Granny' Gordon. ﻿The husky homesteaders killed and dressed out the beeves at their Bull River ranch and loaded the meat onto a horse-drawn wagon. , to haul it the dozen or so miles (about a four-hour trip) over the dusty rough road to the ferry landing on the northside of the Clark's Fork River. It was then ferried across to Smeads. There, they flagged the train, loaded the meat aboard, and shipped it to Trout Creek. The scheme worked fine until one particularly warm day. "I'll tell you what they did," Frank Berray said. "They decided they was going to butcher a cow at four o'clock and take it down to Trout Creek so they'd have it ready to put on the market in the morning. "Granny takes a whack at the cow with the rifle and he missed her. He says to Jim, 'Here, take the next shot and finish her'. That missed. And away she took down the road. She galloped down around Rocky Point and them right after her. When she got onto the level and started running on that flat at the Pilick house dodging around through the timber, Jim takes some shots at her. Cotton, he takes some shots at her and he can't down her. Then Granny opens up. ﻿﻿﻿﻿A while after Cotton's cow-killing disaster, and the June 1907 term of court declared his partner Pat Moran an insane person and appointed Hylent guardian for his estate, Moran, disappeared. He was last seen in Heron, and his disappearance created all kinds of speculation. His father and sister came, mourned him as dead, and looked after his estate and his ranch interests and the butcher shop at Trout Creek that Pat purchased in partnership with Cotton from J. L. Hartman.2. Tongues wagged and created no small problems for Cotton.2 Also that summer, more future grazing land resulted from carelessness when a fellow set a pitch stump on fire in Dry Creek. The blaze quickly leaped into a forest fire roaring up the canyon towards the upper Bull River valley. Since the meadows in the fire's path also were burned hay crops were wiped out. "It was dryer than a woodpeckers nest when me and my brother went out and lit Dad's hayfield afire behind the barn in August. By Jesus that field went faster than a racehorse could run a mile! The next morning when we looked out we had more smokes than the Valley of Ten Thousand Smokes. "Dad told us to get the stonebolt and a couple of barrels and hook up the team and start haulin' water on those blazes. After a couple of days of that we decided it wasn't going to do any good at all. That peat meadow kept right on burning up until it was all covered with snow that winter!" Their lesson about playing with matches was well learned. And, as fathers do, Cap fortified his admonishings by relating the latest news; two of the Italian shanties about a mile east of Heron had burned down consuming all the belongings of the ten or twelve Italians who lived in them. And as a reminder of other dangers, he relayed the news about two more train wrecks at Heron. As yet, having only heard stories of trains wrecked on the Northern Pacific Railroad that came through Heron, his words merely heightened the lad's curiosity. Dealing in homesteads was quite popular at that time and profitable as well. Anthony Wayne Saint came to Noxon in March 1907 and purchased a homestead ranch on upper Pilgrim Creek west of town from one of the earlier settlers. He soon built stables in Noxon on the east side of the Pilgrim Creek road, across from where the US Forest Service's first buildings in Noxon were being built. Saint's son, Ben F., just turned 19 when the family arrived, discovered a new way of life. "Farming had been our chief occupation in Kansas and we knew nothing of the mountains and the hardships we were facing. 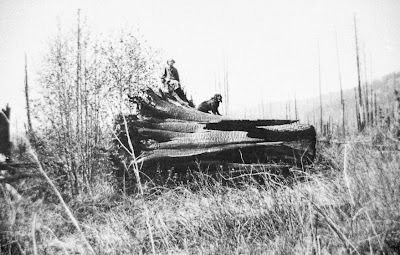 Most of the homestead claims had not been filed on and no one seemed to know at that time that the Cabinet National Forest had been created. But this we were to find out shortly. "First off I got into the woods with a seasoned Lumberjack and finished my education from March 2 to September 20 with an ax and saw. I made posts, poles, fished, drove team and what not, learning how to handle a team and wagon without fighting them. A temperate man taught me that excessive use of Liquor was Bad Business and somehow that stuck with me. He also warned me against buying stock in coming mines and playing other men's Games of Chance so I sidestepped a lot of Pitfalls. "The main means of livelihood was stealing Uncle Sam's timber and selling it for what could be obtained, which was very reasonable in price." 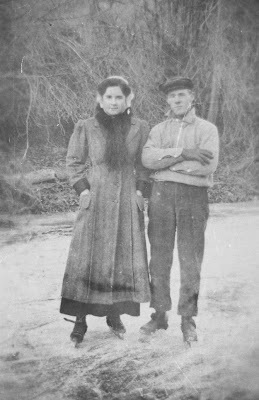 Around the middle of May 1908, Captain and Mrs. Peter Weare returned to Noxon from Seattle where they'd gone for a while. Come for a visit with their son Clifford and his family, they rented a house from Mr. Higgins. Their grandchildren, Cliff's son Neil and his two daughters from his first marriage to Pearl, were growing up and they wanted to enjoy them. Neil was already half as tall as his father. Cliff and Ethel's two girls, Marian and Frieda, were just babies. The grandparents especially enjoyed watching the children play with Sherman, their own mid-life baby who was now a toddler. Sherman was years younger than his brothers, Clifford and Major. Both families enjoyed being reunited again, and wished Major could join them. Even in a wilderness man is basically a social creature. People came into town to dances held in the warehouse part of the Post and Poles store near the railroad tracks, McNall's hotel, or the Noxon hall. They arrived by train, wagon, buggy, horseback, or 'a foot', and stayed overnight in town. In wintertime they came by cutter sleigh. 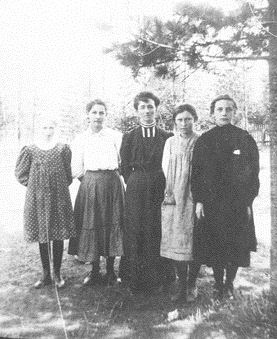 ﻿﻿The settlers were fun loving people, many of them scarcely more than teenagers in 1908. Dances, cards, socials celebrating almost anything that provided an opportunity, brought them together as often as possible. They congregated in houses, stores, and schools. Anyone with a musical skill was glad to have the opportunity to share his or her talent. Yet, even socializing had its difficulties. Once when friends journeyed from Heron for a dance at Higgins house they came by rowboat. Having several small piglets that could not be left to the mercies of the elements overnight, they loaded them up and brought them along to leave in the barn of Higgins neighbors. Then everyone partied all night before returning home after breakfast to do their daily chores. Saloons were the precinct of men and the mode of conduct there was answerable only to the owner and whatever his personality and his patrons approved. Women did not enter saloons, but on the other hand, social gatherings were mixed and no infraction of proper conduct was tolerated. Among women, many a young buck lumberjack, river pig, or prospecting miner in attendance might seem a totally different person from what he appeared when at work or in a saloon. Ladies were treated with meticulous courtesy and their influence on the wilderness was considerable. Yet life was not without hazard. Some kids had been fooling around and knocked a pane out of the window of the Posts and Poles Store. One day Weare noticed two men who'd come in to buy something eyeing the broken window, and suspected that they might return to rob him. 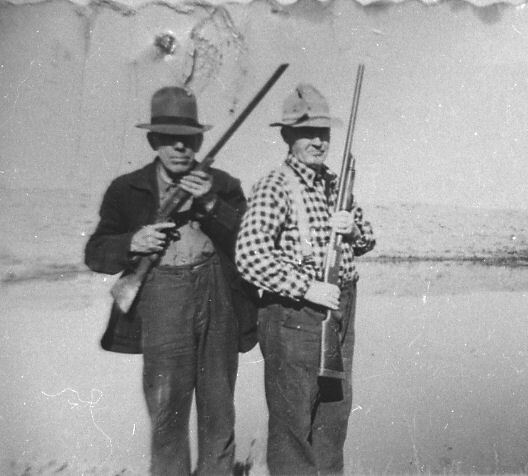 That night before he closed up he borrowed a .44 caliber rifle from Dan DeLong. "About eleven o'clock when I heard them coming in I just slipped out of bed. They heard me and they both went through the window at the same time. They were getting out fast! When I heard them getting out, I jumped out and run to the front door and opened the door. I could hear them running down where the section house used to be. It was raining out. "I thought, 'Now I'll just fire a shot over their heads, not hit them, but get them a boost along a little bit.' Then I changed my mind and didn't shoot. The next morning I thought I'd clean up Dan's gun before I returned it on account of it got wet. I looked in and I couldn't see into the barrel. I felt in there and it was solid! "'Oh,' he says, 'I never thought to tell you. I put resin in there so it wouldn't rust.' "Good thing I didn't shoot it! I sent right off and got me a little .32 Colt automatic. If you shoot a gun that has any obstruction in the barrel it'll blow up," Weare said. 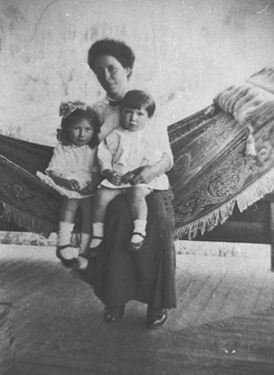 While children in the small hamlets had friends to play with, life on Bull River for a little girl was a lonely affair, according to Helen (Berray) Kirschbaum, whose two brothers were sent to school to Heron. "There were no other children in the valley until I was around six or seven years old. Collogans moved in from Helena. They had a little girl named Clara. In the spring of 1907 The Granville Gordon's moved in to build the first government forest service ranger station. They had two girls so we finally had some women folks and I had some kids to play with." Helen clearly recalled some of her early childhood memories . "I loved horses and my dogs and I played in mud pies a lot. When I was about five years old I was playing behind a stump in the dirt one day. I got a can of water and was mixing mud pies in it. Then I slapped the mud pies on my face," she laughed, recalling her childhood glee. "Mother came out looking for me and she found me with my face all muddied up. 'Helen! I told you not to make yourself up with mud', she scolded me. 'You can play in mud, but don't make yourself up', and she took me off to clean me up. I used to play in mud all day long. And I had a little cart and I'd play with it and my dog. And my big rag doll." Girl and her dog on a stump near river. Courtesy Maxine Higgins Laughlin collection. ﻿Two young women were widowed by accidents the summer of 1909. One of the men fell from a wagonload of posts and was run over. The other one lit a dynamite fuse, and then thinking it went out when it hadn't exploded he returned to relight the fuse only to have the charge go off, killing him instantly. In each case people came from miles around bringing food, offering help in whatever form needed, be it washing clothes, chopping wood, hoeing garden, tending stock or anything they thought of. There were none who did not find some way of showing their sympathy; such was the compassion of the community. It was impossible to avoid meeting with people simply because you might not agree with them. In September the men working for the U S Forest Service were as welcome as was everyone else in the community to attend the dance held in Weare's hall, despite Cliff's run-ins with the recently arrived arm of the law. Speculation about his logging practices wasn't only gossip in lumberjack camps, and charges against him for timber sale infractions were in the making. Nevertheless, the number one rule of survial reigned. With only a couple hundred vulnerable souls scattered through the steep canyons of a thirty-mile radius, dependency became expedient. A person might engage in a heated argument over something the school teacher was doing, only to find themselves the next week teaming up to petition the county commissioners for a road, or in need of the same neighbor to witness a homestead entry. That the unpredictable forces of nature, in the form of fire or storm, could also force a truce had been made clear on more than one occasion. In addition, every deed and nearly every word uttered soon made its way through each household. It seemed the very wind itself bandied ones business about until everyone knew the intimate lives of everyone else within a thirty-mile radius at least. No secrets remained sacred for long. So you either got along - or you got out of the valley. So it was that while men muttered about Weare's great success at selling cedar poles, if anyone suspected him of tampering with their mail, none filed charges. Perhaps they didn't suspect that the always jovial and laughing man could be tucking their envelopes into the cracks in his walls where, rumors said, they were found when the building was dismantled years later. Emmett E. Thompson homestead on Bull River. Courtesy Clayton Bauer collection. Annie and Emmette E. Thompson at their homestead on Bull River, September 2, 1915. Cap Berray and Mrs. Lockman (wearing apron.) Courtesy Clayton Bauers collection. Bauers moved onto the 160 acres Emmett Thompson had first located on, downstream from the new Forest Guard Station in the Bull River valley. A snug log house, barns and chicken house comprised Bauer's ranch. 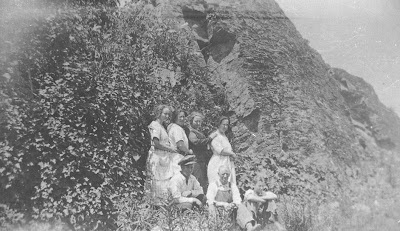 The children especially enjoyed clambering over the steep hillsides surrounding their clearing in the pocket of the mountains. Bull River. Courtesy Clayton Bauer Collection. ﻿﻿Attending women in childbirth didn't appeal to Fanny Hampton. Gay, witty and impish with an English humor straight from her mother country, she busied herself with church and charity work and raised her family by dint of hard work, as did many others. 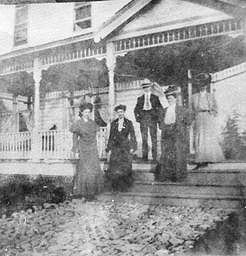 Leaving behind the oak tree Fanny planted nearby, the Hampton family moved from the cabin on the street paralleling the NPRR through Noxon to a homestead west of town. Her new log house did not have running water, was heated with wood stoves, and was surrounded by a clearing and garden hard against the timbered slopes of the mountain. Assisting with school plays allowed expression of her many talents, and was an example that delighted all the lighthearted youngsters of the area. Friends and visitors found charm and graciousness in her home. Her daughters and son grew up guided by her fun loving, moral character. In 1909 scarlet raged through Heron. Some Heronites whose son got sick on a returning train trip from back East, brought it into town. The whole town got scarlet fever before anyone knew what it was. There was an old church across the railroad tracks from town where people went to stay while their house was fumigated to rid it of the disease. The county doctor from Plains came, but it took him a long time to get there. When Carouthers had scarlet fever, his missus was awfully crippled, and they had it bad. Thinking they were all over the serious illness, they had their house fumigated, only to have their boy came down with it the next day. Smallpox also came to Heron. No special treatment was given other than keeping the sick person clean and in bed and warm like for chickenpox. When the county doctor finally was able to come he said it was a wonder the afflicted hadn't died from it.4. Meanwhile Sanders County Commissioners were busy, and in September 1909 they established the Noxon Election Precinct No. 8; voting place at Noxon schoolhouse. Judges appointed were William R. Hayes, Isaac Engles and Sheldon S. Brown. Also that month, apples were shipped to the stores in wooden crates via the railroad. The spray that was used in the orchards to prevent insect damage was toxic and every housewife knew the fruit must be washed before eaten. But one day the Weare toddlers got into a box of unwashed fruit at the Post and Poles store, and each had eaten several bites of apple before being discovered by their parents. All three children became very ill. Clifford and Ethel dosed their little girls with castor oil immediately, hoping to flush the deadly poison out of their system. But Clifford's mother declined the remedy for little Sherman. Soon the toddler was feverish and lethargic and getting sicker. The elderly Weares wrapped him in a quilt, boarded the train and took him to Plains to consult a doctor. Soon after, Clifford cried as he comforted them, more heartsick than anyone under the cool September sun at the graveside of his baby brother, his heart leaden with grief. If only he'd insisted that Sherman be given the castor oil. He felt responsible for the sorrow darkening the autumn years of his parent's lives. Peter and his wife ended their summer-long visit and immediately returned to Seattle . Winter brought sleigh riding and ice-skating parties that added entertainment. And made children hurry through their chores. 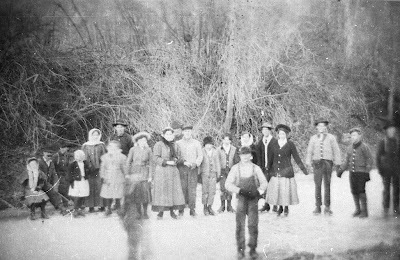 The few women in town provided hot chocolate and pastries, coffee and cakes to enjoy around the big bonfires built on Pilgrim Creek road, at the crest of the community sleighing hill. Cedar posts from Clifford Weare's post piles, stacked along the railroad siding for shipment, provided ample dry wood. Although Weare was too busy making a living to participate in the social life of Noxon, he considered the bonfire fuel a just contribution. Fern Fulks and Ben Saint, ice skaters on Noxon slough. Courtesy Ben F. Saint collection. Illness affected minds as well as bodies. Accompanied by the drizzling early 1910 March rains that hid the mountain peaks in gloomy gray clouds a double tragedy reached its shocking climax in Heron. Finally, unable to take anymore, H. D. 'Missouri' Davis shot Mrs. E. L. Richards and then himself. The letter he left was so vile a description of the triangle love affair that had "worked him of all the money he possessed and then was going to discard him", the newspaper refused to print it.5. New Heron Schoolhouse. Heron, Montana. Courtesy Georgia Knott MacSpadden collection. Frank Berray tape-recorded oral history March 6, 1970. Lucy Allen Jenkins tape-recorded oral history. Sanders County Ledger, March 1910.